Reprinted with permission by Harper Collins Publishing. From Mastering the Art of Japanese Home Cooking by Masaharu Morimoto. For a simple dashi udon broth, please see above. In a large mixing bowl, combine flour and salt. Add 1 1/4 cups water. Use hands to mix until dough starts to come together in a few large lumps. Firmly press and knead the dough, incorporating any loose flour until there is none left. If necessary, add a little more water, 1 tablespoon at a time, until you can incorporate all of the flour. Lightly dust work surface with flour. Knead dough (folding and firmly pressing with your palm, folding and pressing forcefully) until dough looks and feels fairly smooth, about 5 minutes. Form dough into ball, wrap in plastic wrap, and let rest at room temperature for 1-5 hours. On a lightly floured surface with ample room, knead it again for a few minutes. Divide dough into 4 equal-sized balls. Dust each ball with flour and cover with plastic wrap until ready to roll out. Use rolling pin to roll out the dough, occasionally rotating the dough 90 degrees and lightly using with flour if it threatens to stick to the pin, until just between 1/8" to under 1/4" thick. If the dough is too difficult to roll out, cover with plastic wrap, let rest for 10 minutes, and then resume. This rest allows the gluten to relax and makes it easier to roll out. 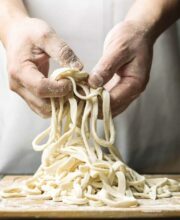 Fold the sheet of dough into thirds (like a letter fold) and then slice widthwise into approximately 1/8" thick noodles. Gently separate the noodles and toss them with a little bit of flour, just so they don't stick together. Cook right away. Drain noodles, transfer to icy water. Briefly and gently rub the noodles with hands to remove some of the starch. Drain from cold water. Homemade Udon Noodles Recipe from Chef Morimoto - Copyright 2017 Steamy Kitchen, Inc.